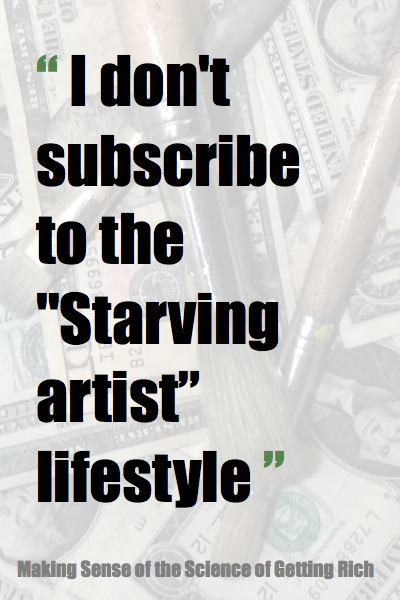 I once believed in the idea of the starving artist: The idea that pursuing a career in the arts was essentially pursuing a career in poverty. Coming from a lower-middle class family of immigrants, there was no way this was going to happen despite my early interest in arts. It was better for me to keep my creative activities as hobbies and pursue a traditional professional career. So, as a result, I became an engineer (luckily I have interests in science so the process was not too painful). But art never really left my side, in fact despite casting it aside, it kept calling me and luring me closer throughout the years until one day, last year, I decided to just jump in and see what would happen. My thought, after finding out about these artists was that if they can make millions, there's no reason why I can't make a good living as an artist. After finding the answer to my first question : "Is it possible? ", my next question was to find out "How do artists become rich?" During my search for the answer to this question, I found an old book claiming to have the answer : The Science of Getting Rich by Wallace D. Wattles. Published in 1910, it is said to have influence several successful people over the years including Napoleon Hill (author of Think and Grow Rich), Rhonda Byrnes (author of The Secret), Tom Buthler-Bowdon (author of the 50 Classics series) and many more. My understanding is that his book is essentially a rags to riches instruction manual. But, perhaps because it was written over 100 years ago, it's difficult to fully understand and a little out of date. I find myself re-reading the book a couple times, taking notes and looking for examples and clues of Wattles' principles in the lives of people who have already achieved success. As my notes are getting more extensive and I'm finding out more fascinating and concrete examples in the lives of known successful people, I figured it would be nice to also put these findings together in a study guide for others to benefit from, which is what I'm currently working on : Making Sense of the Science of Getting Rich. This is also how this blog came to be. I will be documenting some of my thoughts and findings as I go along and share the process of putting everything together with you.